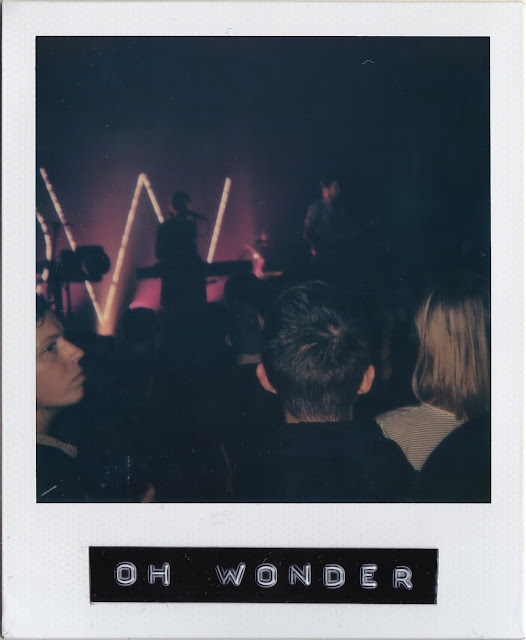 A year ago, Oh Wonder was formed. Josephine Vander Gucht and Anthony West came together first as a couple and then as a musical duo, birthing Oh Wonder like their prodigal first born. I don't want to jump the gun or anything, but whatever they "create", I'll embrace. No pressure. On the 24th of November, I saw them play at Village Underground in Shoreditch. Their music was electronic and the atmosphere electric. Last September, they resolved to release a new song every month for a year, and they've done just that. By the new year, with only a few songs to their name, they had spread across social media like wildfire. They compiled their first fifteen songs into a self-titled debut album in September. Only now have they actually played a gig. In the music business, their model is innovative; create hype by dropping tracks in instalments, come the first of each month. But if their songs are stories, then they're hardly revolutionaries. Dickens' novels were serialised in newspapers; published a chapter at a time. Now, TV shows like Breaking Bad release episodes in instalments. The entertainment industry teases us, dangling new content under our noses and then pulling the rug from under our feet as we lurch in to catch it. Oh Wonder plays hard to get - and we like it. Light a candle. Loop the album. You won't really be able to distinguish between songs but you won't really care. They can credit their success to singles, but the irony is that they work best as an album. Their breezy ballads never reach a climax, but in succession, their crisp, clear sound feels almost cinematic. They could be more adventurous, but then they don't strive for escapism. They blissfully blend male-female harmonies with electronic pop to lull you into your surroundings. You don't want to go anywhere else when this is what you've got.